This is Mont-Saint-Michel, a mountain church and fortification turned monastery turned tourist attraction. It is in Normandy, France, and it could serve as a dead ringer at low tide for Tolkien’s fictional Minas Tirith (the Tower of Guard), formerly Minas Anor, the Tower of the Sun. Could this have been the inspiration for the capital of the Gondorin? So far as I know from studying Tolkien and his magnum opus the answer is no, it isn’t. But it is fascinating to think that it might be. 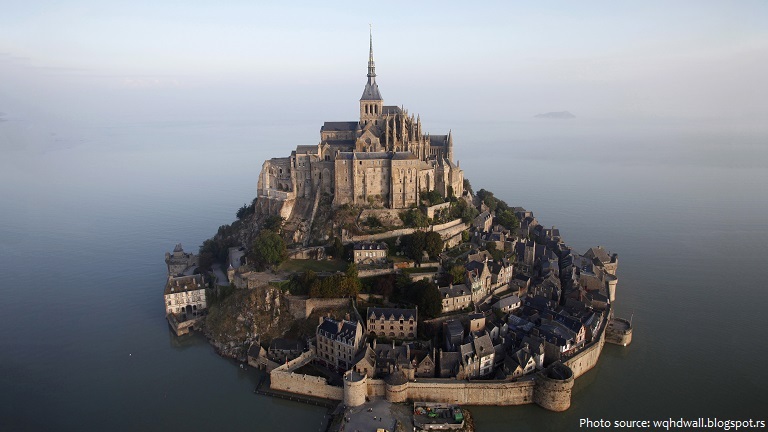 Learn more about Mont-Saint-Michel below, readers! It’s so pretty and cool! This has been on the bucket list for a long time. By the way, I stopped by the site because I got a homeschooling funny today and thought of you. We’re struggling with Latin (as you do) and the daughter product was wishing she had that Roman Centurion minifig from Night At The Museum to consult.